On their self-titled debut album released earlier this year, the Burlington Bread Boys introduced Queen City audiences to "kazoo-core." That's a raffish offshoot of old-time and jug-band music characterized by a ragged but energetic approach to playing and songwriting. Also, kazoos. That record was pleasantly — and appropriately — rough around the edges, offering a reasonable approximation of the band's unkempt live shows. What it lacked in fidelity, it more than made up in hoary charisma. In short, it was a wildly fun record. The Bread Boys are back with a new album, Pushing Rope, which further showcases the group's singularly scruffy charm. But this time around, the band enlisted the notable talents of songwriter Zach DuPont on mixing and the Tank Studio's Ben Collette on mastering. The result is an album that preserves the unhinged energy of the band's debut but presents a vastly improved auditory experience. In particular, great care seems to have been paid to Ethan Tapper's lead vocals. In addition to that scrappy string-band aesthetic, his scratchy, melodic growl is among the band's most defining qualities. On the debut release, his voice was too often buried in the mix. But here it's front and center, as it should be. Tapper's throaty delivery is prettily unpretty, which could really describe the BBB in general. There's symbiosis between the band's goofy energy and Tapper's cheeky musings on love gone wrong ("Pushing Rope"), secret crushes ("You Scare the Living Sh** Out of Me") and an ill-fated date in Chinatown ("Asian Food"). The improved sound quality works the other way around, too. Trading more on precociousness than precision, the Bread Boys will never be confused with a virtuoso string band. But they can play. And with a cleaner mix, their individual talents stand out. Tapper lays down rock-solid rhythm guitar. Chris Cartier unfurls some surprisingly nimble mandolin licks — in addition to some grinningly clumsy ones. Jon Kraus is fiendish on the washboard. Also, kazoos. Sadly, backing vocalist and lead kazooist, Max Krieger has recently left town for law school. (Here's a question for Max: Which do you think the world really needs more of, lawyers or fun kazoo-core bands? Just sayin'...) So it's possible this will be the last we hear from the Burlington Bread Boys, at least for a while. But if they join the ranks of innumerable local bands that have released one or two great records before calling it quits, Pushing Rope will be a fine addition to the collection. 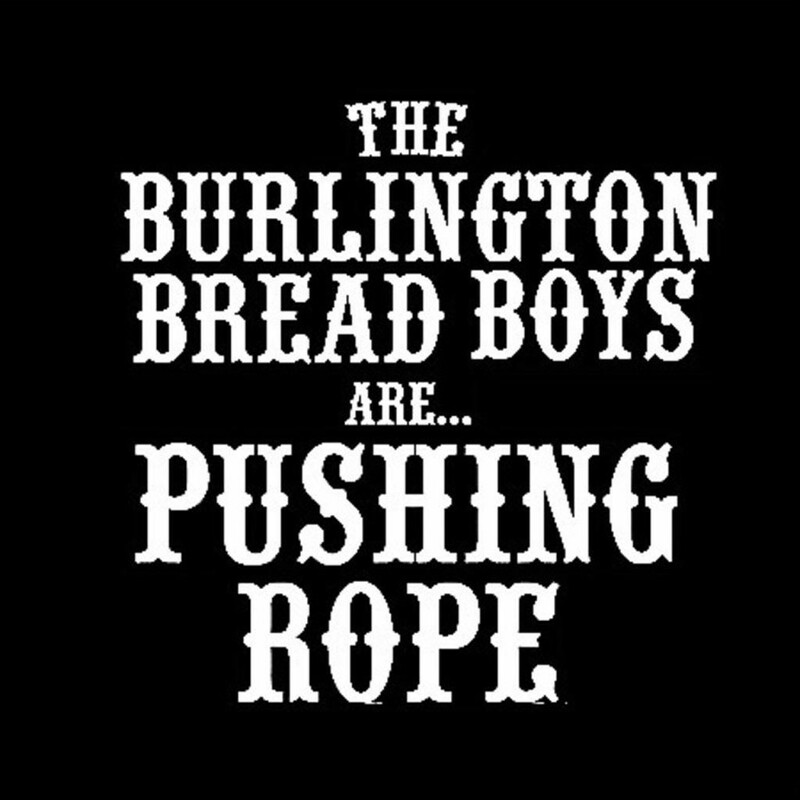 Pushing Rope by the Burlington Bread Boys is available at theburlingtonbreadboys.bandcamp.com.